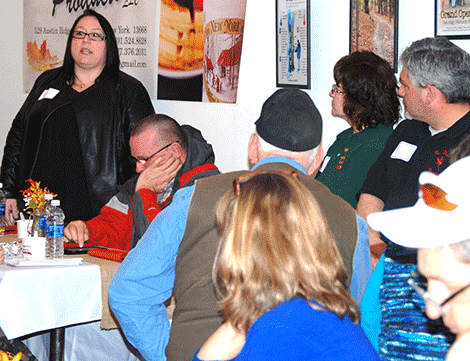 Finen Maple Products in Norwood hosted the St. Lawrence County 'Spotlight' event. NORWOOD -- Erica Leonard, St. Lawrence Centre Mall general manager, presented an outline of events and promotions for the upcoming year at the recent St. Lawrence County Chamber of Commerce ‘Business in the Spotlight’ held Wednesday night. The event was hosted by Jim and Margaret Finen of Finen Maple Products in Norwood and highlighted Adirondack 1892, Inc.; Finen Maple Products, Northern Insuring Agency, Potsdam Public Library, St. Lawrence Central Mall and Symquest. Guests were treated to a variety of maple-themed foods and had an opportunity to network with area businesses. Finen Maple recently opened a store in February at the mall in Massena.